DW is now available on the OTT platform YuppTV, which is comparable to portals like Hulu and Netflix. YuppTV will be including DW in its channel lineup and has more than 2 million registered users in India, Pakistan, Bangladesh, Sri Lanka, Nepal and Bhutan. DW is now also being offered by the first IPTV provider in Nepal. New IT Venture (NITV) is the largest Internet provider and currently the only IPTV provider in Nepal with plans to expand nationwide. The Mongolian broadcaster TM-TV will now be including Made in Germany, Global 3000, Drive It, Discover Germany and Euromaxx in its program. La Nación Chile has recently been added as a new online partner for DW. Since 2010, the renowned newspaper has been available as an online-only news source. It receives an average of 1.8 page visits per month and is among the most-visited websites in Chile. La Nación will be syndicating DW content including full articles. DW news in 12 languages are included in the newly-launched MSN news apps. This makes online content from DW not only available on all Windows mobile handsets and msn.com, but also expands the reach to iOS and Android devices. Onneshon is now available in India and Bangladesh. The science show that is broadcast in Bengali will be made available in Eastern India on Doordarshan Bangla (DD Bangla). A weekly version of Euromaxx is now being produced and broadcast in Ukrainian. The new adaptation of the classic show is being produced in cooperation with ZIK-TV, with which DW has been working with since the beginning of 2014. ZIK-TV also rebroadcasts Geofaktor and Focus on Europe. The culture magazine Camorote.21 is now being broadcast nationwide in Brazil by TV Brasil. The public broadcaster is part of the EBC (Empresa brasileira de comunicação) and focuses on informational and cultural programming. A new deal between DW and the Indian public service broadcaster, Doordarshan (DD), is a groundbreaking step towards bringing Indian television to Europe. For the first time in its 55 years of operation, DD will be available via a free-to-air DTH service outside of India. The deal opens the door to a symbiotic distribution model with which DD India, DD’s international channel, will be broadcast in Europe using DW’s satellite capacity and in exchange, DW will be broadcast using the satellite capacity of DD Freedish in India. The exchange of capacities is good for both sides and a positive development in a market where using partners is essential to success. Other international broadcasters like France 24 have also recently signed distribution contracts using DD broadcasting facilities, but unlike with DW, it was a one way deal with no provision for rebroadcasting DD content in return. Since its launch in 1995, DD India has made many attempts at broadcasting to international audiences and even paid to uplink the channel to satellites. But the lack of any downlink agreements continually kept the channel from being broadcast. DD India’s mission is to “build bridges of communication to Indians living abroad and showcase the real India.” The deal with DW will give DD India the potential to reach 120 million homes abroad. DW will reach a potential 25.5 million homes in India via DD Freedish. 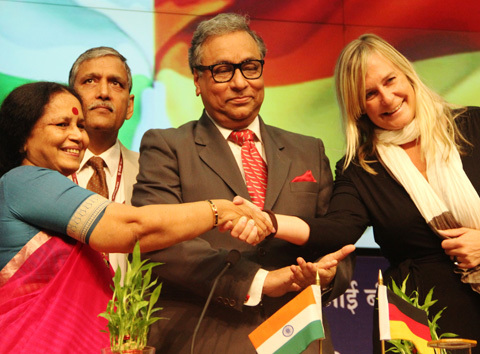 The deal was announced in a joint press conference in New Delhi attended by DW representatives, officials from the German embassy, and the CEO of Prasar Bharati, which operates DD. DD India plans to start broadcasting internationally via the Hotbird 13b satellite in October.